Where can I get the bottle? Bottles can be obtained from many outlets locally including health centres, doctor’s surgeries (including Alresford), chemists, the Community Centre, The Herald Office in Alton and The Lions Stall on our monthly Craft Market. We continue to look for new venues so if you think we are missing one please let us know. There is no cost to the user. 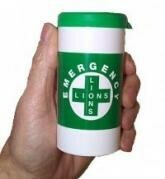 Costs of running the scheme locally are borne by Alton Lions Club. In addition, it is strongly recommend that users also include your repeat prescription list. This is produced every time a repeat prescription is ordered, and this information is of great value to the ambulance service. Paramedics are able to administer drugs, but need to know what medication is already being taken to eliminate the risk of drug interaction.